Once home to Vanderbilts, this lakefront estate offers farmstead cheeses and freshly sourced game. 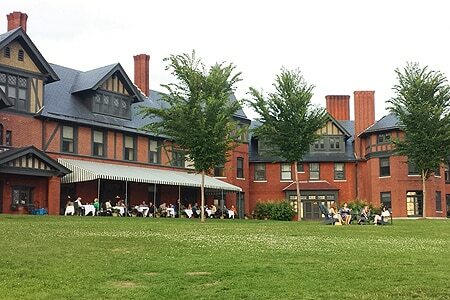 : Dining at Shelburne Farms feels a bit like role playing. Once a summer retreat for the Vanderbilt Webbs, this sprawling estate, surrounded by bucolic fields and majestic views of Lake Champlain, allows you to assume the grandeur of American nobility, especially once you enter the Inn’s signature fine dining room, which conveys old-world splendor without pretension. The menu centers on seasonal game and produce raised and grown just beyond its hallowed walls --- from lettuce to lamb --- as well as the farms' own dairy products. Start with the house charcuterie, a palette of venison heart sausage, liverwurst and rabbit confit. Move on to Shelburne Farms beef with shelling beans, pumpkin and tomatillo sauce or Maple Wind Farm chicken with smoked cheddar orecchiette, oyster mushrooms and chard. Finish with the chocolate ganache torte or, for the purist, try one of the farmstead cheddars with a cold Sauvignon Blanc. While you can dine al fresco on the terrace, the west-facing marble dining room presents no less striking vistas, and the service is far more elegant. Be sure to call ahead for the seasonal schedule of the Inn, which closes in winter.